The Best Coconut Cake You'll Ever Make - Home. Made. Interest. 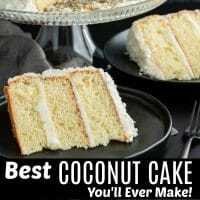 I love this coconut cake recipe and I’m not exaggerating when I tell you that it is the BEST Coconut Cake You’ll Ever Make! 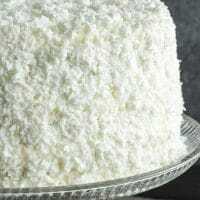 This homemade coconut cake recipe has been making an appearance as a holiday dessert recipe since I was a little girl. My grandma used to make it for Easter dessert, Thanksgiving dessert, and if I asked extra nice, Christmas dessert. Everyone in my family loves it, even the ones who aren’t a big fan of coconut cake. The secret ingredient is cream of coconut and fresh coconut. 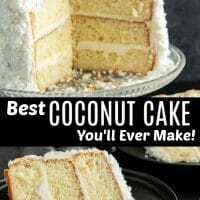 It is sooo much better than that dried, sweetened coconut you find in the baking aisle! Coconut cake is a southern tradition (just like this Hummingbird Cake!) and I love my grandma’s version. When I was grown and on my own this was one of the first recipes I called her up and asked for along with her broccoli casserole recipe…yum! Grandma J. wasn’t a from scratch baker (that was my other grandma) and this cake starts with a boxed cake mix but you doctor it up by skipping the instructions and ingredients on the back of the box and instead adding eggs, oil, sour cream and cream of coconut. They make the cake so moist! What is Cream of Coconut vs. Coconut Cream? Coconut cream is the cream that rises to the top of coconut milk. You can make your own by simmering four parts shredded coconut in one part water. Cream of Coconut is coconut cream that has been sweetened like sweetened condensed milk in coconut form. It is most often used in cocktails and has a super intense and sweet coconut flavor. This recipe calls for cream of coconut and you should not substitute coconut cream. You can find cream of coconut with the other drink mixers at the grocery store. The most common brand is Coco Lopez. 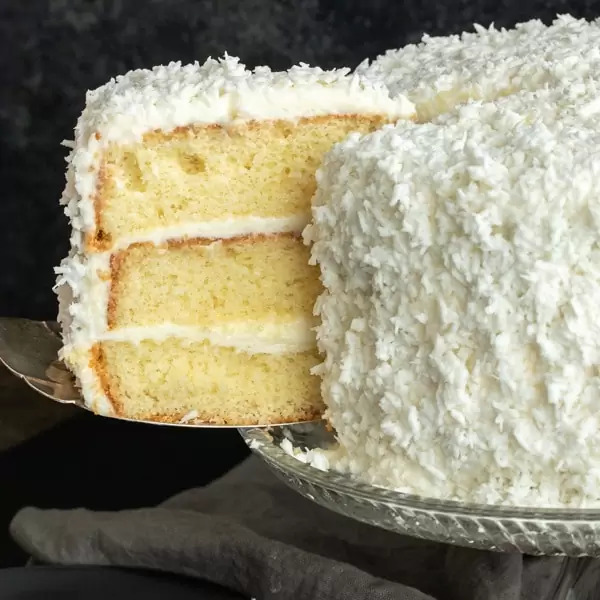 The thing that I think makes it so much better than a lot of store bought coconut cakes is that it is coated in fresh coconut. None of that shredded coconut you find on the shelves. Fresh coconut is usually shaved and can be found in the freezer section near the frozen fruit at the grocery store. Goya, Bird’s Eye, and Harris Teeter are the brands of fresh frozen coconut I have used. I have found them at Harris Teeter, Food Lion, Trader Joes (it comes in chunks you will need to shred yourself), Asian markets. Do I thaw the fresh coconut before putting it on the cake? I usually take my frozen coconut out of it’s bag and break it apart in a small bowl. Then I let it sit there as I frost the cake. It only take a few minutes to thaw. It will be very moist because it is fresh coconut. You can pat it with a paper towel to remove some of the excess moisture if needed. What goes best with coconut? 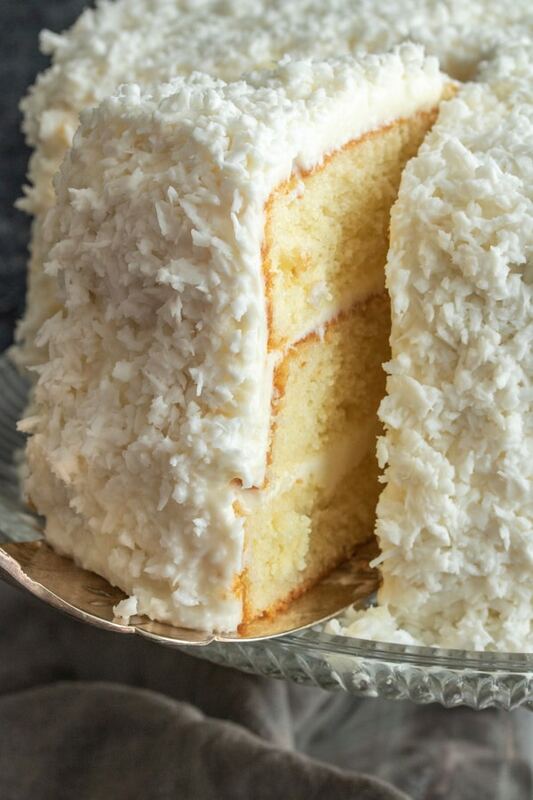 If you’re thinking about adding a little extra flavor to your coconut cake you can add a filling in between the layers. The flavors that go best with coconut are lemon (check out my how to make lemon curd), lime, strawberry, orange or mango. 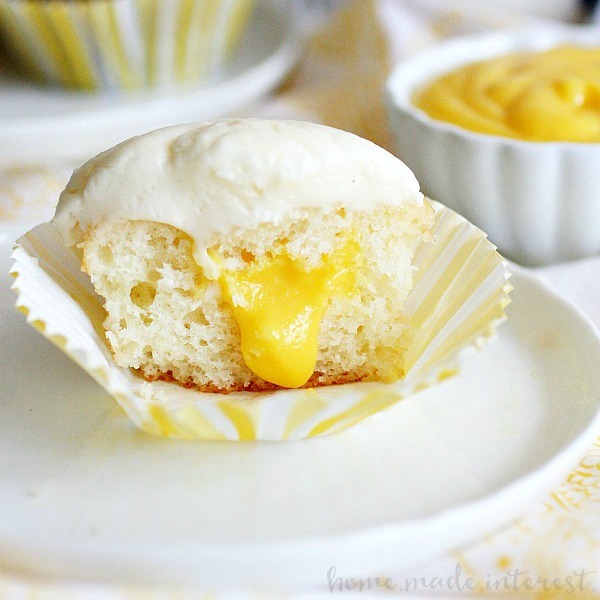 I’ve used a mango curd filling with this coconut cake recipe and with my coconut mango cupcakes and it was a huge hit! 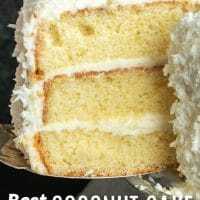 Can you freeze coconut cake? Yes, you can freeze coconut cake. Actually, the thing that I love about this cake is that you should make it at least a day ahead of time and put it in the freezer. At least that’s what my grandma said and you really should always listen to grandma. It’s pretty great because for the holidays you can make it ahead of time and then pull it out a few hours before your party and have an amazing dessert. 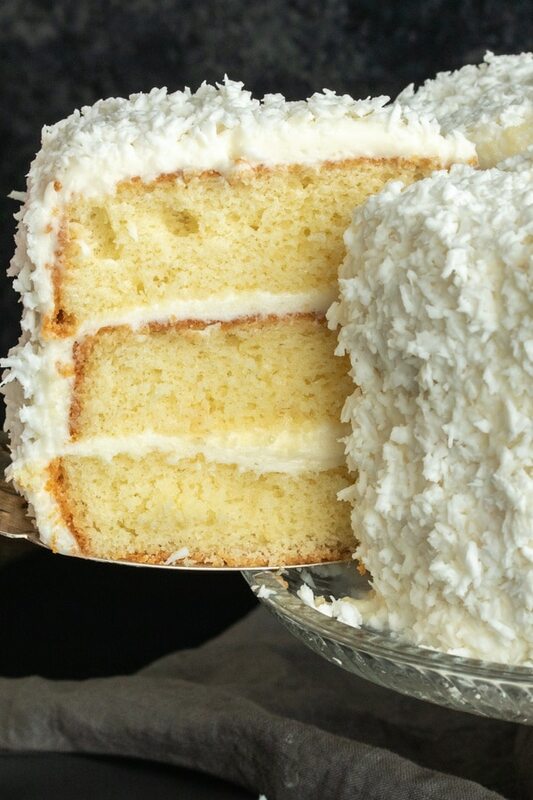 Assemble the cake, frost it and add the fresh coconut on the outside. Then you wrap it with two layers of plastic wrap to seal in the freshness. Cover it with a layer or two of aluminum foil to insulate the cake and keep it from getting freezer burn. 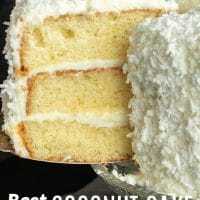 Place the coconut cake in the freezer until you are ready to use. 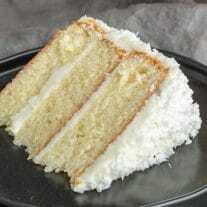 Remove the coconut cake at least 4 hours before you are ready to serve to give it time to thaw. Note: This is NOT required. The cake will still be delicious if you don’t freeze it ahead of time. 3 9-inch cake pans – I like having 3 identical cake pans so I can divide up the batter and bake everything at one time. Cake Boards – Placing your cake on a cake board before frosting makes it much easier to wrap it up and store it in the freezer. Cake Carrier – You’re going to need to take this cake to all of your events from now on! This cake is a really special memory for me. Grandma doesn’t get to cook for us during the holidays anymore but I know she’d be happy to hear that I’m baking her cake! I hope you try it and if you do I hope you love it as much as I do. This is the best coconut cake recipe I’ve ever made. 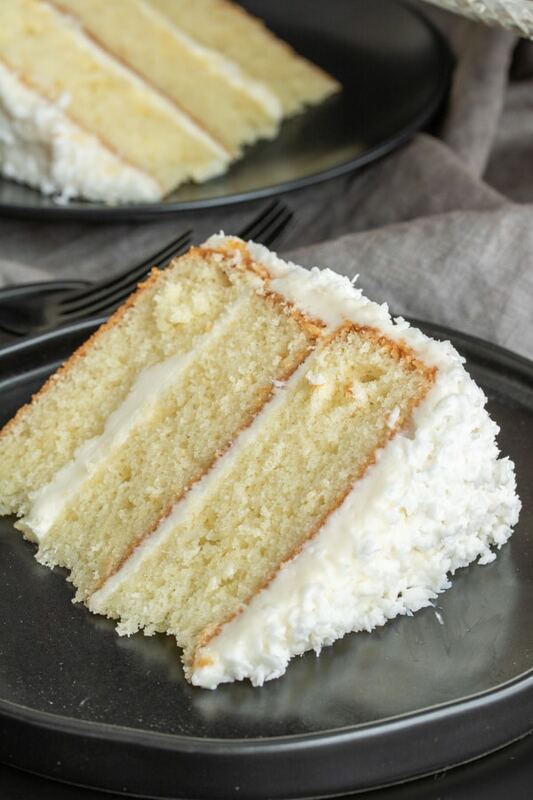 This easy coconut cake is moist and delicious and uses fresh coconut! Mix cake mix, sour cream, vegetable oil, eggs, and cream of coconut in a large bowl. Divide cake batter into evenly between 3 9” pans that have been greased and floured. Each pan should be filled to slightly higher than 1/2 to ensure that the cake does not overflow as it bakes. You may have extra batter. Bake approximately 30 minutes at 350°F or until you can put a toothpick in the center and it comes out clean. Whisk powdered sugar and cream cheese together in the bowl of your mixer. Add vanilla and keep whisking. Add milk as needed to reach a spreadable texture (this may not take all 4 tablespoons of milk). Place 1 9 inch round cake on a cake board (this will make it easier to move cake to the freezer. If you are not freezing it you can skip this step). Frost the top of the layer and place the next cake round on top. Frost the top of that round and place the final round on top. 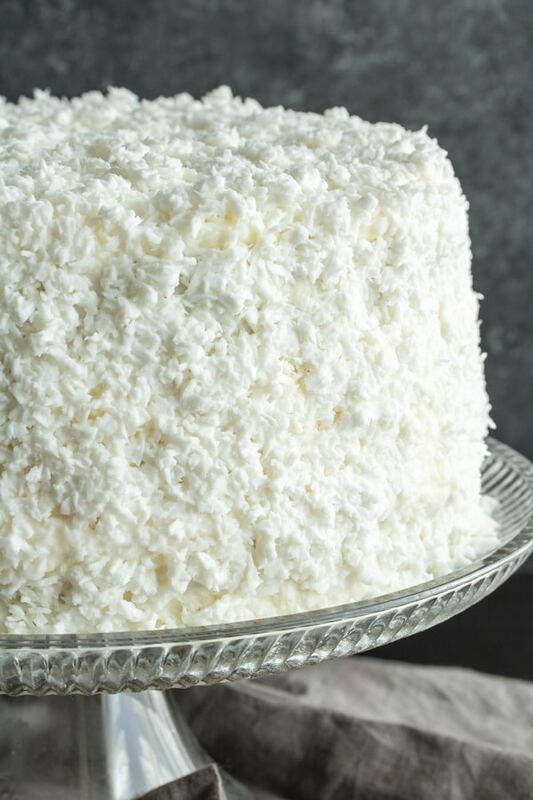 Press coconut into sides and onto top of cake. Once cake is frosted wrap it in plastic wrap and then aluminum foil and place in the freezer. Take it out to thaw at least 4 hours before you are ready to serve. NOTE: By Popular request I have included the ingredient amounts for the 2 layer version of this cake below. The instructions for making the cake are the same you'll just be using 2 9-inch round cake pans rather than 3. Enjoy! Update Notes: This recipe was originally published on 6/25/2015 and was updated to include new photos on 4/10/2019. Just a quick question….does the xoxonut milk need to be sweet or unsweet? Hi Brandi, there is no coconut milk in this recipe just cream of coconut which is a super sweet coconut liquid used to flavor drinks like Pina coladas. Hello Kat, we are about to put your grandmothers cake in the oven, but we are not freezing it, we are wanting to have it for Christmas, so does it need to refrigerated, or with the weather cool like it is, is it okay in a cake plate with a cover. 9126745527 is my number in case I don’t get the email. I’m not a cocnut fan and made this 4 my husband. OMG…this was delicious. The cake itself is so moist and does not taste like a box at all! My only issue was my cakes cooked over and made a mess but I was still able 2 pull it off. The coconut cake wasn’t the best. It was impossible to find the frozen coconut. We substituted it with unsweetened shredded coconut which was tasteless and too hard even though we rehydrated it. We followed the directions exactly and although the cake had a good texture the frosting was WAY too sweet!!! Hi Diane, I’m sorry you didn’t like the cake. The frozen coconut is really what makes it stand out and I have never made it with anything other than that. I’m sorry you couldn’t find it in your area we have several places that sell it in our area. 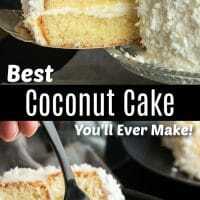 Always loved coconut cake so looking forward to trying this soon. Tks for sharing. We are putting a cook book together for family and friends please give me permission to add this to out book. Hi Debbie, if it is only for a small group of family and friends (under 30 people), you are not selling it, and it will not be reproduced online, you have our permission to reprint the recipe for personal use. Hi just had a question, when you make the frosting do you mix the coconut with the frosting or add it on after you frost the cake? Add it on after you frost the cake. Cake came out amazing my fiancé was so happy thanks for sharing this! Yay! You made my day. So glad you guys enjoyed it! How do you thaw the coconut? Hi Sheila, I usually put it in a bowl and break it up a but with my fingers then leave it sitting on the counter for maybe 20 minutes. The coconut thaws very quickly. I made this for my husband and he LOVES IT. He said it was the best he’s ever had. BRAVO! Thank you SO MUCH for coming back to let us know how it turned out. I’m so glad your husband liked it. I made this cake for Christmas! Huge hit! I had a craving for coconut cake the way grandma used to make. This one is perfect! I took it a step further and used a step mentioned in the comments. I poked holes in the cake and poured the cream of coconut mixture over each layer. This recipe also gained me a challenge from my niece who doesn’t care for coconut. She asked if I could make it with some other filling. Well, she loves pineapples so that’s the route I took. You make your own “CoCo Lopez”, I went half a cup of each of pineapple juice from the can and sweetened condensed milk. Sooooo gooooodddddd! Great recipe! 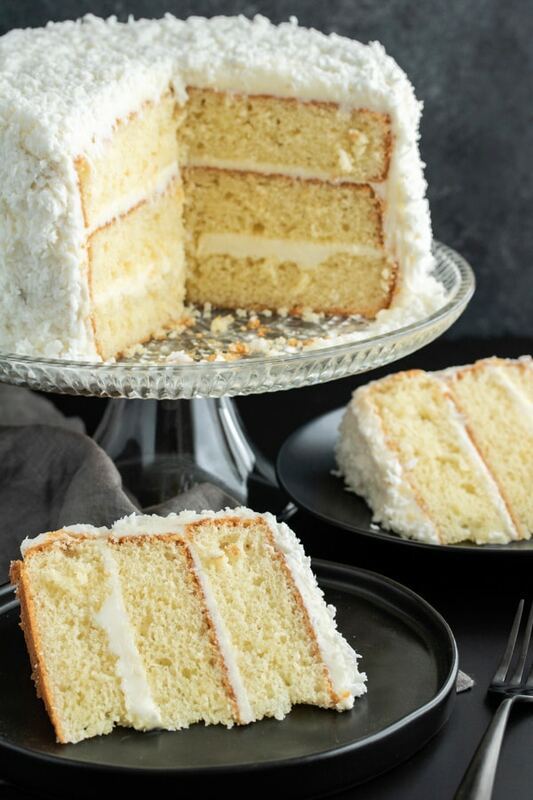 Can this cake be made using a yellow cake mix instead of the white cake mix? Yes! Just sub the yellow for the white and the rest of the instructions stay the same. This cake is seriously the best I have ever made. My husband ask for it weekly! I usually cheat and use whip cream as my frosting because we are not big on it being too sweet. I also add crushed pineapple (juice also) in between the layers. It really makes it delicious!! Thanks for the recipe!! I’m so happy to hear that. The whipped cream frosting sounds like a great idea. I was wondering if you could use Greek yogurt instead of sour cream in this recipe? I’ve never tried it but I think it would work the same. can this cake be successful using only egg whites if so how many egg whites? Hi Carol, I am sure you could make this with only egg whites but I have never attempted it so I’m afraid I can’t say how many to use. I would look at what they ask for on the back of the box and go with that (maybe add one extra egg white). you have 6 eggs in the 3 pan recipe, and 3 eggs in the 2 pan recipe, which is correct? Depends on which recipe you want to make. The original recipe is for 3 pans (3 layers) which uses 6 eggs. Some readers wanted only 2 pans (layers), that will be 3 eggs. Hope this helps answer you question. Hi, I see that one person used the coconut in the bag and hated it. I only have access to that and I want to try this cake. Other then that one person, have you had any other complaints using that type? I know several people have used the shredded, sweetened coconut in the bag and still liked it. I think the one who used bagged and hated it was using unsweetened and they tried to rehydrate it. 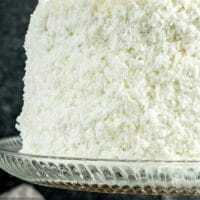 If you absolutely can’t find fresh I would use the sweetened shredded coconut flakes found in the baking aisle. It won’t be quite the same but it works! I haven’t made this yet….but my sister made it for Easter a couple of years ago and it was the best dessert I’ve ever had. I dream about it. I think I’m going to try to make it this weekend if I can find the fresh coconut. It is truly divine. PS. She did make it and freeze it…I’m not sure if that contributed to how moist and delicious it was, but I’m definitely going to freeze it as well hoping it turns out just as good. This comment makes me so happy! I hope you love it as much the second time around! Every time I use this recipe, my cakes are so sticky and they fall apart. I bake all the time and I’ve never had a recipe where my cake does this every single time! The flavor is great but the cake falls apart. Hi Jess, I’m sorry you’ve had that problem. I haven’t experienced it myself. My only advice would be to make sure it has cooled completely before handling. I’m not sure if that will make a difference but it is worth a try. can you leave this cake sitting out for awhile? I was going to make it for a cake auction and it will need to sit out for a few hours? Hi Kate, when I make it for my family it always sits out all day and we have never had a problem 🙂 The only uncooked dairy in the recipe is the small amount of milk in the frosting. Use your own judgement though! I love this cake! Have you ever made it as a sheet cake version? I’ve made this for pot lucks at work but we have so many people now I was thinking a sheet cake version may be more economical. Best Cake ever! I have never made a sheet cake version but there are always instructions on the back of the box for baking in a 13×9 inch pan so you could totally make it that way. I suggest using the measurements for the 2 layer version since that uses 1 box of cake mix (I’m afraid using 2 boxes would overflow the pan!). Hello I’ve made your recipe several times and we absolutely LOVE!!! Have you ever added crushed pineapples? I’m so happy you like it. I haven’t tried crushed pineapple but it sounds delicious!! Hello Kat, thank you so much for this recipe. Everytime I make its delish. I do have one problem I’m hoping you can help me. I leave the cake in the oven for 30min. I’ll check to see if they are done and most of time they are. But once the cake is cooled down it deflates. It dosen’t stay nice and puffy. Would you happen to know why this is happening. I haven’t had this problem myself but I know a few people have mentioned it so you aren’t alone. In general a cake that sinks in the middle is often slightly under-baked. Maybe next time you could give it just a little longer in the oven to see if that makes a difference? Do you use whole eggs or the egg whites? Things went terribly wrong. 1) The baking volume is off. When I used 3 9″ cake rounds, they overflowed in the oven. The only changes I did were to sift the boxed cake mix and use Cake strips around the outside of the rounds to prevent overdone edges. 2) they were not done in 30 min when I did the toothpick test. They were starting to brown at 30 minutes so I had to lower the temp to 325 and continued to bake it for 25 more minutes to get no jiggle in the center of the rounds. Tastes good. Hi David, I’m so sorry you had that experience! I’ve made this cake dozens of times and I’ve never had it overflow and it is always done in the time I listed. I suppose it could have to do with the boxed cake mix used but I usually just buy whatever is on sale and don’t stick with one brand. Is this batter supposed to be real thick??? Hi Debbie, I’m so happy your son-in-law liked the cake! You are totally right the Frozen fresh coconut is not sweetened so it isn’t as sweet as the sweetened dried coconut. You can definitely add coconut extract instead of vanilla extract or do 1/2 tsp vanilla 1/2 tsp coconut extract depending on how much coconut flavor you want. Hey ladies…everyone loved this cake! I have a couple of questions….reading through some past post, I added in 1 tsp coconut extract into cake mix. I want more coconut flavoring so can I add more to the mix or to the icing instead of the milk? I used the frozen coconut and it is not sweet or coco-nutty like the traditional bagged coconut. Thanks in advance for any help. I just baked the cake and realized I used coconut cream, not cream of coconut. Coconut cream is not sweet. I tried the batter and thought it tasted like vanilla cake so I added a teas of coconut extract,I hope that works. I could not find shredded frozen coconut, but I found frozen coconut chunks. I ran them through the food processor using the grater and it seemed to work great. Since once again I am afraid the coconut taste will not shine through, I added a squirt of coconut extract and a tablespoon on sugar to the shredded coconut. I also added coconut extract and a few drops of almond extract to the fronting. I hope it tastes OK. I’m going to freeze it tonight and serve it on three nights at a party.